I really love the pillow, it would be nice to write what you want on it in the future. Hugs & Kisses is what you'll get when you cuddle up to this Personalized Couples Throw Pillow. You and your sweetheart will enjoy this Personalized Throw Pillow for Valentine's Day or to celebrate the beginning of your lives together. The great design offered on this Throw Pillow will let everyone who visits know, the love you both share with each other is never ending. This makes a great, romantic gift for a number of occasions. Our Romantic Throw Pillow is printed on one side and is available on our premium 9.5oz Canvas Pillow Sham, Black Back,14" x 14". Pillow Form is a soft, resilient, bouncy polyester fiber form. Includes FREE Personalization! 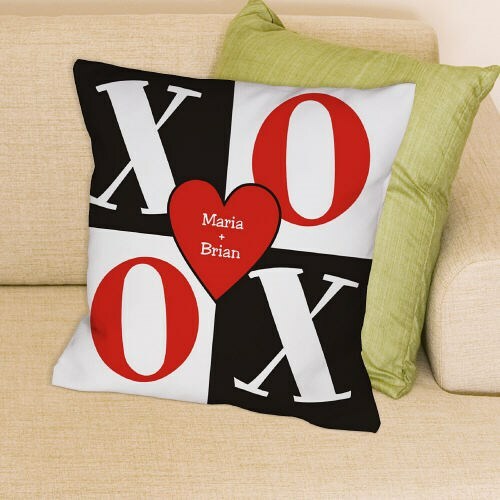 Personalize your XOXO Throw Pillow with any two names. Additional Details Our collection of Romantic Plush Animals is what you'll need to show someone one how much they mean to you. Along with this Loving Throw Pillow, your sweetheart will also enjoy receiving our Personalized I Heart You Teddy Bear & our I Heart You T-Shirt as well.